Beirut-based artist, theatre director, actor and writer Rabih Mroué is a central figure in post-Civil War Beirut’s avant-garde scene. 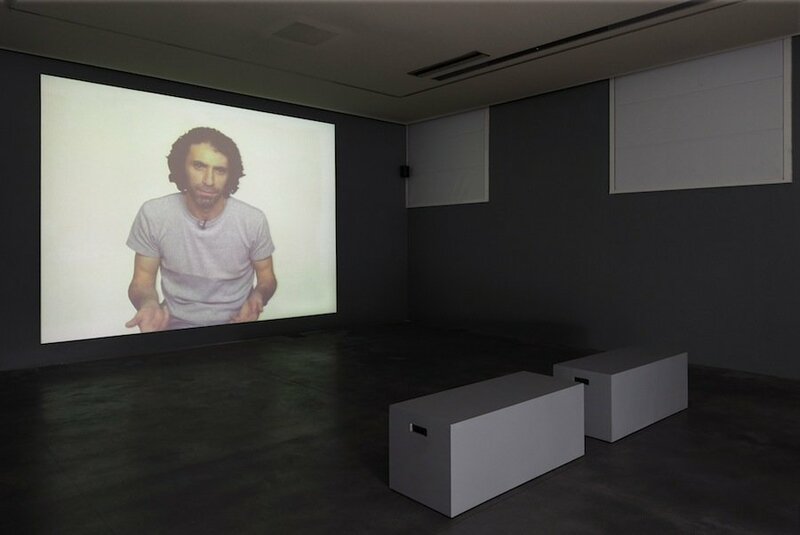 Beginning his career in the early 1990s, he has produced performances, video work and installations meditating on and questioning the legacy of Lebanon’s Civil War (1975-1990). A regular collaborator with Lebanese artists Joana Hadjithomas and Khalil Joreige, Mroué appeared alongside French actress Catherine Deneuve in their 2008 film, Je Veux Voir. His stage works conjoin the worlds of theatre and performance art as well as narrative fact and fiction. Mroué is making his US debut on the 6 January 2012, at the Baryshnikov Arts Center’s Howard Gilman Performance Space in New York, as part of PS122’s COIL Festival, after he which he will perform at institutions across North America. For this tour, he is presenting a new ‘lecture-performance’ entitled The Pixelated Revolution (2012), commissioned by the 2010 Spalding Gray Award. The Pixelated Revolutionexplores the use of social media in the Syrian revolution, finding connections between the demands and aesthetics of filming protests and the dictates of Dogme 95, the latter being a filmmaking manifesto originating from Denmark in the mid-1990s. 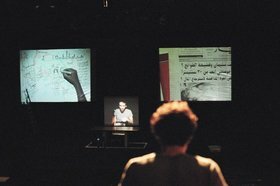 Mroué will also be performing Looking for a Missing Employee (2003), which explores the troubling and unexplained disappearance of a Lebanese civil servant. In this interview for Ibraaz, Anthony Downey spoke with Mroué about The Pixelated Revolution, his cross-disciplinary practice and the artist’s ambition, as he puts it, to ‘de-sacralize’ the image rather than produce more imagery. A central component in this process, Mroué explains, is an exploration of how narrative – through elision, selection and rhetoric – functions as a device for inflecting and refracting realities. Anthony Downey: I’m going to start with the work you will be premiering in New York, called The Pixelated Revolution, which explores the role of social media in the Syrian revolution. Can you talk about that work and the background to it because it looks like a departure from previous ways of working? Rabih Mroué: The Pixelated Revolution is about a number of things: firstly, it is about actuality and what is happening now and, secondly, that which is still ongoing in the Syrian revolution. In this sense, it’s quite problematic to talk about something that is still ongoing, something unsettled and unfinished. However, it’s not something new in thematic terms. I’ve been working and reflecting upon the use of images in the media and in public spaces for a long time –since at least the Civil War in Lebanon. For example, in 2000, and in collaboration with Elias Khoury, I was examining these issues in a work called Three Posters (2000). The work looked at the video testimonies of a Communist suicide bomber in Lebanon. One of the main issues it reflected upon was the use of the image and the power of the image; and of video testimony as a trace after such a violent act. My work The Inhabitants of Images (2009) is a lecture-performance that likewise deals with the street posters that appear in the city of Beirut. It’s a reflection on the use of images, the people who were killed and how we see their images in posters throughout the city. In Lebanon, they are called martyrs. The Pixelated Revolution is therefore dealing with something that I have been thinking about for a long time and, at the same time, is also something that is still ongoing. As part of this revolution in Syria, the people who are using their mobile phones are creating and making this event and also recording it at the same time – they are still doing this, so it’s a bit confusing in this respect to fully understand what is going on. I have heard a lot about the fact that it’s still too early to discuss the issue, and how can one reflect upon something that is still ongoing. Lebanon is very close to Syria, so we are very much still affected by what’s going on there. So for me, The Pixelated Revolutiontalks about specific images in this revolution that have been recorded by Syrian protesters and uploaded to the Internet. Not everything; I’m talking about very specific videos that took my attention and I should highlight that in this work I’m not doing any kind of activism, I’m not interested in this. This is about how images are being produced and used in the Syrian revolution. AD: You mentioned Three Posters in relation to The Pixelated Revolution and the one notable thing is that both works are performances. With Three Posters, you interjected yourself back in time to a found film of a suicide bomber who had produced three different versions of his martyr’s video before choosing the correct version. However, with The Pixelated Revolution, you have interjected yourself into the present – a present moment that is highly problematic in terms of representation. 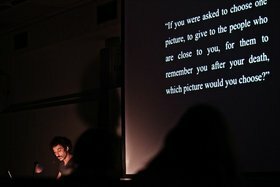 How does The Pixelated Revolution work as a performance lecture in the present rather than the past? RM: Just to clarify, in terms of the structure of both works:Three Posters is a performance, it’s not a lecture at all. I remember that at the time we used the term ‘performance-video’ and The Pixelated Revolution is a lecture-performance. I would prefer to say that it’s a ‘non-academic lecture’, in the sense that it doesn’t question the space in which I’m performing. The space is very classical, in terms of its relationship to the audience: there is a lecturer, the audience, and someone who is talking and showing images and lecturing, and people who are listening. And then maybe there will be questions following the lecture-performance. But in Three Posters, as a performance, it was about questioning the space itself, the relationship between the audience and the stage, between the audience and the action that is taking place on stage, and the location of the audience in terms of what is going on in this story. 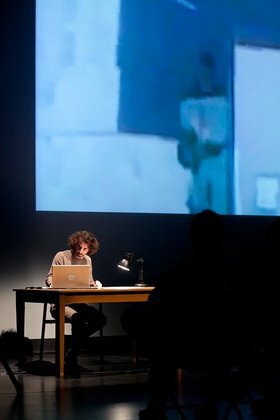 So in this sense, The Pixelated Revolution is much more a lecture than a performance, although there are some personal matters that I am trying to reflect upon from a personal perspective and to talk about in relation to the Syrian revolution. AD: In effect, then, The Pixelated Revolution is less self-reflexive in relation to the space, whereas Three Posters had a very distinct locatedness as a form of theatrical mediation. I wonder if that distinction can be carried through to the subject matter of The Pixelated Revolution; because, as I understand it, you’ve used social media and images from social media, which is often seen as a process of unmediated storytelling, or unmediated reportage. Does that have any bearing on the work – the fact that the images are not taken by you, they are archival and part of the so-called world-wide web, another component in the proliferation of images? RM: Yes, actually, it’s a very interesting point that you bring up, because if I look to my works, especially those from the last year or so, most of them actually use found materials. I’m not the one who recorded or produced them. And this came out of my belief that it’s now very difficult for artists to produce images, especially with the glut of imagery in the media. The question seems simple enough: What images can artists produce and is it possible to confront these images that we receive every day with yet more images that we produce? These are the questions that I pose in many of my works. And I agree with some intellectuals that maybe the role of artists and even intellectuals is not to produce images but to take iconic images and try to deconstruct them. To ‘de-sacralize’ them. There are a lot of images that have become icons that have in turn become untouchable. For example, when I talk about the street posters of martyrs, it’s a taboo to talk about them – these images impose themselves on society and it’s difficult to question their presence and impact on our daily lives. As in the media or on the Internet, there are millions of images that come to us every day but only some become famous and a model and are followed by other images and videos. And they become iconic and get used by all political positions and in various different discourses. My work is trying not to produce new images but to find and take these images and deconstruct them through reflection and by re-reading them in a human, personalized manner. AD: So effectively, there’s a process of demystifying the iconography associated with certain images. For example, I note in the publicity for The Pixelated Revolution, you have adapted aspects of Dogme 95, which is a very pared-down, almost alienating process of producing images that takes everything back to basics. It is also almost independent of the artist. Is that part of the thinking here? RM: Right. Actually, I would like to mention two specific things that are common to the two. I underline them because they are very important to the video recordings coming out of the Syrian revolution. In Dogme 95, there is this instruction that you should not use a tripod. And for the Syrians, it’s not a choice – it’s still very, very, difficult to use a tripod to record their reality. And there is another issue in Dogme 95, where it stipulates that you should not record violent scenes, or weapons, because they don’t want to fake these things. So it’s not necessary to use them. For the Syrians, they add to this dictate insofar as the violent scenes being recorded are actually for real and the stipulation is also correct – do not record violence – insofar as the weapon could kill them and the scene of killing is thereafter real. There is no attempt to fake death here – it is all too real. RM: Yes, your reading is right. This case of the missing employee (one Rafat Suleiman), cannot be found anymore unless you go back to the newspapers. It’s not mentioned as with other cases in history books or political books about the spirit of that period. So this case, along with many others in Lebanon, ended up without an ending. We don’t know why the case was shut down. But we know that it took place in a country that is highly corrupt and one in which the administration is corrupt. They swept it under the rug and moved on without solving anything, without really knowing what actually happened. So I just tried to collect everything I could about this case, from national newspapers and local newspapers. And I tried to tell this story, the whole story, out of what had been written in the newspapers. Without doing anything else, just by reading the newspapers day-by-day, you can see how the mechanism of this medium works. It interests me, inasmuch as this work is not about revealing or accusing or saying that we are being manipulated by the media. It’s just to know about and be aware of how newspapers and other media work, to be conscious of it. And they belong to the same logic as ‘chatting’ and gossip, as if you can say whatever you want and the next day, or an hour later, you can change your mind, your position. It’s something like informal talk or conversation, rather than incontrovertible fact. And you can see this in newspapers: from one day to another, they change their position completely and they don’t bother to make an apology or issue a retraction – it’s as if nothing ever happened, as if no contradiction has been made in the recounting of the story of a missing employee. This is very interesting – it’s not an accusation at all but an examination of how the mechanism works and how to understand or how to read this kind of unreliable narration. RM: Yes, it’s an aspect. But it’s not necessarily about the Lebanese Civil War but rather the Lebanese situation, its society and politics, because I live there. I believe that you can talk about things that you know very, very well in order to deconstruct them. So in a way, it’s very local but when you dig deeper, I think that anyone can watch or read the work, even if they don’t know anything about Lebanon or the issues that I am talking about. The way you are dealing with this subject makes you, or the audience, or the spectator, immediately project back to your own circumstances or countries and problems. So it’s a process of translation. Even if you miss out on a lot of detail about Beirut, you immediately translate it to your own situation. AD: So it’s arguable that while the politics of Lebanon are important here, the work is more specifically about the politics of narrative – what narrative does, how it interprets, how it has its own inherent politics in terms of ellipses and gaps, its apparent full stops and cul-de-sacs. It’s about how to read (or not read) narrative – about how to read the politics of a narrated situation. RM: I agree and can add that the narrative should be unfinished, open, and full of gaps that can be filled. And what is important is that it should be open to interpretations and not only interpretations but also misunderstandings, even if sometimes it’s really hard to accept that. But this is important to any work – the potential to be misunderstood. AD: Indeed, a sort of withdrawal of understanding, pulling the viewer or the audience into a position where they do not come away with any simplistic or easy answers. 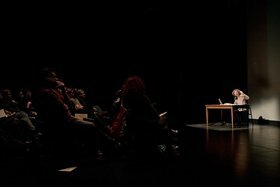 I would add one thing to that: insofar as your work is often set in a specific time, it is not only about the politics of narrative but also the politics of theatricality – what theatre does to narrative. I see in your work elements of Samuel Beckett’s plays, particularly Krapp’s Last Tape (1957), where a man sits and listens to a recording of himself as a younger man and all the doubts and elisions and insights that occur therein. I also see elements of Luigi Pirandello’s Six Characters in Search of an Author (1921). Both are dealing with deconstructing the relationship of the audience to the play but also implicating the audience in the process itself. I was wondering if that has a resonance with what you do with theatre? RM: I think of theatre as something very open and I refuse to put forward a definition of what theatre means. For me, theatre is a continuous kind of research and questioning and thinking and it’s not something framed. For this reason, it’s really a place in which we contemplate the past, the future, and the here and now. We think aloud, we put ideas in front of an audience that consists of individuals. And this is important to remember in terms of this gathering of people who are sometimes in the dark, to deal with each one as a singular entity rather than one mass of people. And this comes from a very simple thing: that we don’t need to fulfil or teach the audience, or be in a position where we have the knowledge or the power to say what is true or untrue. We need to not give answers. And this is what I always try to do: posit questions. It’s not that I ask a question and I have the answer and am hiding it. No, I really don’t have an answer, I just have the question. Or I put forward doubts, problematic matters, without attempting to solve them. This means that each member of the audience should deal with this matter by themselves alone. In this way, they become singular individuals. For me, theatre is a platform where one can create a dialogue and share ideas and it’s not necessary that this dialogue takes place immediately, during the show, but after the performance, what comes after. Everything starts when we finish the performance, not when we start it. It is when the people leave the theatre and the actors leave the stage that the work really starts. AD: It’s like the work asks the audience to ask, what is my relation to the work? But there is another question, where do I belong in relation to it? 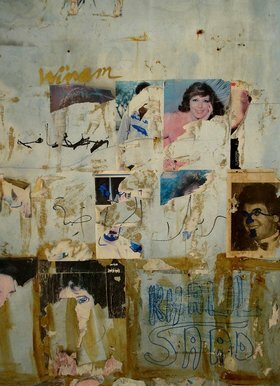 What is it to even be a citizen in the context of present-day Lebanon; what it is to belong to a certain narrative; what is it to belong to a certain place and what are the ramifications of this; what is it to belong in relation to the work but also broader socio-political, philosophical and economic moments in time? RM: I agree to a certain extent but maybe I don’t like the word ‘belong’ here – maybe I’m not sure, I will have to think about it. Because belonging to something means that you conform to it. I was always afraid of being stuck in something, that there are rules and limits that you have to respect when you belong to something. Of course, I respect laws. In Lebanon, we are struggling to have laws, in fact. We are still fighting to have our rights as citizens within a State. Because we are still differentiated by our religions, it’s a confessional system and we are controlled by it and we follow by default. There is no way to be secular in Lebanon, to be equal to others. There is always the leader, or religious leader that people follow. So in this sense, we are still fighting to have laws, to belong to a State. And that sense of belonging (or not belonging) is always going to be problematic. Mroué, Rabih. “Lost in Narration: Rabih Mroué in Conversation with Anthony Downey.” Interview by Anthony Downey. Ibraaz. Ibraaz, 5 Jan. 2012.